Interpreting an art-historical episode through the lenses of social and economic history, the aim of this essay is to reveal how the critical reception of American sculpture in the late 1920s and early 30s served as a proxy for broader conversations about economic value during a period of extraordinary financial volatility. Specifically, the essay examines a moment in which discursive parallels between sculpture and the mass market became especially vexed: at the staging and reception of a comprehensive survey show of contemporary works, mostly in cast bronze, organized by the National Sculpture Society (NSS) in San Francisco during the spring of 1929. Optimistically promoted as the biggest exhibition of its kind, the show drew unanimous rebuke for that reason. The show had too many works that critics had already seen, too many monumental versions of familiar table-top bronzes, too many ornate household objets d’art, and—above all else—just too many pieces. This line of criticism was aimed squarely at what might be called “cultural overproduction,” an aesthetic problem that ran exactly parallel to perceptions of excess in the marketplace at the same time. This essay offers a thorough reception history of the exhibit, Contemporary American Sculpture, and seeks to offer a model for an economically-informed social history of interwar aesthetics. Dating to the American Great Depression, these quotations reflect on one of its most disturbing ironies: the problem of overproduction. Described in the mid-nineteenth century by Marx and Engels as “an epidemic that, in all earlier epochs, would have seemed an absurdity” (48), overproduction can be summarized as the manufacture of goods in excess of demand. According to the theory, once producers produce too much, an economically devastating chain of events is set into motion: the market becomes saturated, demand dwindles, prices fall, and profits plummet. An elegant, but perhaps oversimplified, account of causal boom-to-bust, the concept has always carried more cultural cachet than scholarly seriousness. In 1892, Thorstein Veblen examined the “overproduction fallacy” at length; and, in 1898, John B. Clark considered the divergence between scholarly and popular perceptions of market fluctuations, acknowledging that people tend to make fetishes out of “vaguely expressed single terms” (1). “Overproduction,” in particular, he noted, was a well-worn favorite. But such intellection mattered little after 1929. By then, overproduction emerged as the most common-sensical way to account for the catastrophic downturn. It is this popular use of “overproduction” that occupies my attention in the following essay: a cultural historical account of a “crisis” perceived in American sculpture, precisely during that tipping-point year of 1929. It was during that spring that the National Sculpture Society (NSS) held its survey show in San Francisco, a comprehensive exhibition representing the contemporary state of American sculpture. Optimistically promoted as the biggest exhibition of its kind, the show drew nearly unanimous rebuke—and for exactly the reason of scale. There were too many works that critics had already seen, too many tabletop reproductions of familiar monuments, too many ornate objets d’art, and, above all else, just too many pieces. This line of criticism was aimed squarely, if mostly tacitly, at overproduction. As an art historian, I do not share the concerns of Veblen and others who would interrogate the economic legitimacy of the overproduction conceit. Instead, I am interested in its cultural function as a symbolic scapegoat. I am keen to interrogate its currency, in other words, as a moral, even aesthetic explanatory device; its reprisal of a certain millenarian outlook, keeping watch for symptoms of decadence and decline; and its suitability as a rationale not just for the Great Depression, but also for its perceived attendant crises, including those in the arts. Indeed, it is its symbolic, moral, and aesthetic valences, I believe, that primed overproduction for easy transference to the art-world and its press. This essay is sustained by this very premise. So, to state it again, I maintain: symbolic appeals to overproduction in popular-press coverage of finance carried over to symbolic appeals to cultural overproduction in popular-press coverage of the arts. From this foundational premise, I argue also that this scenario yielded specific results for American sculpture, a medium especially vulnerable to marketplace comparisons (as I’ll discuss), and one I think decisively re-shaped by the overproduction critique. Looking carefully at a moment of critical failure—namely, the National Sculpture Society’s flop in San Francisco in 1929—certain discursive patterns become apparent. Examining these patterns offers an opportunity to emphasize the cultural and social contexts of American twentieth-century sculptural modernism, especially as this would develop into an aesthetic protocol of simplification and subtraction during the volatile years of the Machine Age. In view of the many failures they perceived in the NSS exhibition, critics repeatedly prescribed a common cure, one that would parallel those pursued by American business leaders and the U.S. government for the marketplace in the coming years. Where the latter would prosecute a strategy of scaled-back supply during the ensuing Depression—pulling goods from the shelves, leaving lettuce in the fields to rot—art-press pundits argued that American sculpture could also regain value by reducing its output, at least figuratively. Simplify and cut back: these would be the ascendant directives of sculptural discourse in these years. Critics routinely urged sculptors to simplify their practice; and, in San Francisco in 1929, they routinely praised sculptors who had achieved this goal most literally: by going back to sculpture’s rudiments through the practice of hand-carving—cutting, as one writer put it, “as primitives cut, without subterfuge or pretense” (“Wood”). Indeed carving, in the view of many critics, could allow artists to achieve artistic “honesty” (Douglas, “Fine Exhibit”): a swipe at the “counterfeit…cuteness” that academically-trained sculptors had otherwise unleashed (Jewell 658). Besides manifesting the very ideal of cutting back, hand-carving also ensured that artists would achieve the twinned goals of simplification and artistic correction—this by dint of being so laboriously difficult, thus limiting the sculptor to both a narrow expressive range and a modest number of total works. Hand-cutting figures from single blocks of wood or stone was only one approach in what I maintain was a pervasively subtractive sculptural attitude during the interwar period. Abstract sculpture’s preference for pared-down simplicity visually figured the turn toward subtraction, yielding restrained works void of detail, elaborations, and ornament. Indeed, these experiments often turned “void” itself into a positive term—the very center of sculpture’s significance. (Alexander Archipenko routinely pointed to negative space as the primary site of his modernist intervention. This was an established enough truism of his practice that the St. Paul Pioneer Press could snicker in 1921: “Mr. Archipenko expresses himself by the absence of things. Do you get that? Instead of painting a woman’s breast or a man’s head he paints a hole” [qtd. in Michaelsen and Kuralnik 51].) But even those avant-garde practices apparently less concerned with formal or procedural subtraction still flirted with its logic. Dada’s readymades relied on acts of selection and decontextualization: subtracting one commodity from a world of identical others. In the case of the 1929 show, where NSS officials had proudly kept abstract and absurdist variants of modernism to a minimum, carving was left to carry the day. A small selection of simple, hand-carved pieces rose again and again to the top of the critics’ esteem. In both form and process, these pieces—works by Robert Laurent, William Zorach, and others who wore the mantle of so-called “direct carving”—augured the coming shift toward planned market contraction. The exhibition is an especially useful case study, then. It illustrates, first, the critical distaste for cultural overproduction and, second, the subsequent embrace of sculptural subtraction as its solution: two issues I maintain were major vectors of modernist sculptural aesthetics in these years. In what follows, I will recount how the National Sculpture Society put on its sprawling show of contemporary American sculpture in San Francisco; I will then examine how a tidal wave of advance excitement quickly crashed into critical rebuke; and I will conclude, finally, by investigating how and why direct-carving practices emerged as the exhibition’s only bright spot. Telling the story sequentially in this way will allow me to clarify the perceived aesthetic deficiencies that direct carving was seen to address, so that its significance in histories of twentieth-century American sculpture becomes visible not just for what it was, but more clearly for what it was not. On a Sunday morning in 1929, thousands of San Franciscans ventured to the city’s California Palace of the Legion of Honor. [Figures 1 and 2] In 1929, just three years after its dedication, the Palace still shimmered in the dull glare of the San Francisco sun. With imposing colonnades, a triumphal arch entryway, and a series of funereal friezes, the Beaux-Arts building dutifully performed its commemorative service to the city’s World War I dead—and perfectly replicated the mood of its prototype, the Palais de la Légion d’Honneur in Paris, of which the California building was a three-quarter-sized reproduction. Located west of downtown and perched on ocean cliffs, the “Palace by the Sea” (Ross) offered stunning views of Golden Gate, not yet spanned by its landmark bridge. The NSS had adopted the attitude of forward-looking change agent since its establishment in 1893, when it promised to usher in a new day for American sculpture. The organization was founded upon the very premise of self-improvement, a posture that signaled optimism even as it simultaneously maligned the history of the nation’s sculpture-so-far. The NSS positioned American sculpture as a cultural underdog. As a New York Times article reported on the society’s efforts to contribute to the ornamentation of the Library of Congress in 1894: sculpture had for too long been “the Cinderella of the arts” lagging behind its “two Proud Sisters,” painting and architecture. At times, NSS spokespeople even characterized the country’s plastic arts in the worst possible terms. American civic monuments were “deplorable” and a “disgrace” (“National Sculpture Society,” 1895). “Our Statues Are Bad” ran the New York Times headline the day after NSS Secretary Frederick Wellington Ruckstuhl addressed a professional meeting of architects in 1894. 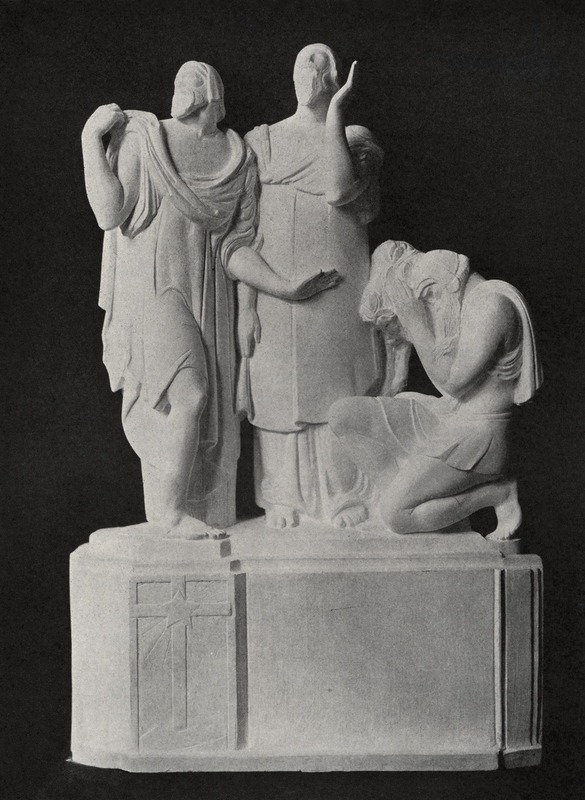 In response to sculpture’s lamentable condition, then, the society announced itself as an enterprising and cutting-edge band of sculptors, architects, and patrons (“including a number of ladies” [“National Sculpture Society,” 1894]), seeking to improve sculpture, by refreshing the medium’s style and by impressing its contemporary relevance upon the wider public. As founding member Charles de Kay put it in The Quarterly Illustrator: “The Meaning of the National Sculpture Society is no less than an effort . . . to drag American sculpture out of the mire” (193). But, thusly rescued, where was sculpture to go? Again, official opinions were explicit. “It is time,” de Kay wrote in the catalog for the society’s third exhibition in 1898, “that [sculpture] entered vestibule, hall and drawing-room, billiard and smoking gallery, breakfast-room and chamber, adapting itself as to subject and kind and color to all the varied needs of modern life” (6). In this regard, the promotional activities of the NSS may be said to have mimicked the approach taken in Britain, under the banner of the “New Sculpture” in the 1880s and ’90s. The New Sculpture not only embraced a range of styles, materials, and techniques (from the historical and traditional to the innovative and industrial), it also pursued commercial avenues for the art form, so as to expand its relevance to contemporary audiences. As sculpture historian Martina Droth has argued, artists of the New Sculpture pursued a course that would more boldly announce the medium’s modernity. This meant a highly diverse set of artistic practices, mixing not only classical references with more contemporary realisms, but also combining a variety of materials and techniques in a single work. So too, in the American context, the NSS’s goal for sculpture was nothing less than its vital integration into the course of everyday life: a goal that was advanced not only through the artistic routes of style, material, and technique, but also through commercial-friendly routes like batch production, actively courted relations with commercial foundries and galleries, and the choice of ornamental subjects and forms, readymade for the domestic interior. The comparison to British precedent, however, runs somewhat afoul of the nationalist distinctions of the day. Indeed, American sculptors at the turn of the twentieth century did not have London on their mind (nor Rome, as would have been typical a generation prior). Instead, they aimed toward Paris, where study at the École des Beaux Arts had become de rigeur (Coles 170–79). By the 1920s, most of the major members of the Society, including Herbert Adams, James Earl Fraser, Harriet Frishmuth, and Frederick MacMonnies, practiced in the French academic mode, under the capacious banner of the Beaux Arts style. Typifying the approach, turn-of-the-century American sculptors experimented with exuberant figures, animated surfaces, and dynamic lines. Works were achieved first in wax or clay, later to be cast in bronze or other metal. In its most expressive form, French-derived sculptural modernism was irrevocably associated with Rodin. The elaborately worked surfaces of his figures, leaving plain evidence of his finger work, dramatized both personal expression and the modelling-and-casting processes that enabled it. But even in its more cautious iterations—when artistic expression was tied less idiosyncratically to personal genius, and more to high-minded morals (like Fraser’s) or light-hearted humanity (like Frishmuth’s)—the French approach (like the British) offered American sculptors the opportunity to assert their modernity. As sculpture historian Roberta Tarbell put it in 1979, “At the turn of the century, skill in sculpture paralleled virtuosity in modeling” (45). In order to ensure sculpture’s relevance further—to make it, according to a New York Times piece, “popular” (“National Sculpture Society,” 1895)—the NSS established a series of exhibitions. These large-scale shows came replete with well-illustrated catalogs, sumptuously decorated galleries, and a selection of domestically-scaled works, priced and available for sale (Conner and Rosenkranz 3). [Figure 5] Building on sculpture’s success at the World’s Columbian Exposition in Chicago—a galvanizing event that led to the NSS’s founding (and perhaps set it down the path of expo-sized exhibitions)—the organization opened its first show in December of 1893. Seven more exhibitions of this same comprehensive scale would follow before 1929, all originating in New York except for two (one in Baltimore in 1908 and one in Buffalo at the Albright Art Gallery in 1916); one in 1909–10 would travel to five cities, none west of St. Louis. The society’s exhibitions consistently met with acclaim, perhaps none more so than its especially sizable blockbuster of 1923. Praised by the New York Herald for its “pleasing effect” of “permanence” (“Five Societies”), the show included more than 730 works executed by over 250 artists. It was the largest sculpture show in the U.S. then to date, and critics responded positively to its “splendor” (“Sculptor’s”), its “fresh, unspoilt quality” (Cortissoz), and the “triumph” (Breuning) of its installation. What is important about this praise is that it extolled a show nearly identical—in both spirit and contents—to the later (failed) exhibition San Francisco. It’s a control case, in other words: a pattern for the later ’29 offering, and so all the more striking in its differences. Chiefly, and decisively, the difference between the shows was size; the later show was almost twice as big as its precedent. By 1929, size would be damning: an ill-fated “attempt,” wrote one critic, “to convince the public, in weights and numbers that American monumental sculpture is a thriving authentic art” (Millier, “Nation’s”). Referring to the exhibit pieces as “treasure,” the Chronicle reinforced a motif that recurred through several of the show’s advance reports: one that referred to the shipments in terms of plundered booty. At this stage of the show (i.e., before it opened), the characterization flattered the exhibition through classicizing allusion. “Such a movement in art,” wrote an anonymous observer for the San Francisco Examiner, had hardly been seen “since Napoleon looted the galleries of Italy or the Roman galleys came back laden with the sculptured treasures of ancient Greece” (“Art Classics”). Shipments, indeed, became a favorite motif among writers, though some opted for a more light-hearted circus theme. The San Francisco Bulletin played the part of the barker: “From east and west, north and south, by steamship and railway, thousands of pieces of sculpture are arriving in San Francisco, to be exhibits in the greatest sculpture show America has ever had” (“17 Carloads”). A writer for the Examiner drew another comparison: the scene recalled Christmas morning for him, although he allowed that the “joy of women and children in opening parcels and packages seems almost mild in comparison with the delight of strong men when opening enormous cases . . . [of] sculptured treasures” (Douglas, “Fine Works”). (The gendered hierarchy of these statements tracked with an existing conceit, bandied about by the NSS itself: that sculpture was the more masculine art, compared to the feminine domain of painting.) Throughout early March, newspapers continued reports of the show’s piecemeal arrival by “shipload” (about three of them [“Art Treasure”]) and “carload” (railroad freights numbering somewhere between eleven and seventeen [“San Francisco Exhibit”]). Internal reports obsessed over the effort, too; the society’s official historian Horace Moran later called it a “huge undertaking” that had taken a “heavy toll” on the society’s resources. Energies may have been depleted, but not coffers. The show’s shipping costs had generously been covered by Archer M. Huntington, the private philanthropist and heir to the California railroad fortune. Huntington pursued a range of cultural interests during the 1910s and ’20s, and was active in both the American Numismatic Society, a coin-collecting organization and ally to NSS efforts in medal design, and New York’s Hispanic Society, host of the 1923 NSS exhibit. Indeed, it had been in the course of planning that earlier show that Huntington’s involvement with American sculpture had deepened significantly—and quite personally. An acquaintance with Anna Hyatt, sculptor and NSS member, developed into a courtship and then a marriage (Eden 23–24). In San Francisco in 1929, her El Cid would be one of the biggest works on display: a plaster equestrian monument installed on the Legion of Honor’s front lawn. To transport that work alone had reportedly required a full railroad car (“Two New York Artists”). The associated costs were deferred by her husband’s donation: his highly-publicized contribution of $100,000 (over a million dollars in today’s money) was earmarked entirely for costs related to packing and shipping. Stylistically, the works ran a gamut, sometimes even within single works. Indeed, the dominant Beaux Arts mode was a capacious one, accommodating a hybrid, quotational approach. Thus, Leo Friedlander’s The Three Wise Men could cross-reference classical antiquity with modern styling. [Figure 6] The group, a plaster cast of a work designed for a Berkeley chapel, redrew classicism’s penchant for kneeling figures and frozen emotional attitude in a neatly drafted, flatly planed Machine Age look. Naturalism, a mode of unidealized realism that American sculptors had long claimed as a kind of national style, was indeed fittingly well represented in the NSS show. Although by the early twentieth century, many art critics had begun to worry that the style had turned sculptors into mere “manicurists” (Cox 25), Laura Gardin Fraser’s Simplicity showed off a less obsessive and thus arguably more successful version of the trend. [Figure 8] The figure’s gentle contrapposto settled the body into a series of asymmetrical angles and folds: lifelike toes edging forward on the pedestal in a daring, Ovidian flirtation with the frame. A few works in San Francisco carried the Rodin torch of expressivism, including Robert P. Baker’s The Soul Struggle and Haig Patigian’s Friendship. Many more pieces, however, were in the garden and fountain genre, the latter replete with a retinue of splashing dolphins and sea horses (as in Beatrice Fenton’s Nereid Fountain and M. Earl Cummings’s Neptune’s Daughter). Finally, a handful of experimental works, executed in what the Art News characterized as a “highly modernistic style” (“National Sculpture Society Exhibition”) were also on view, though these were a distinct minority—so much so that several writers lamented that Archipenko, in particular, had so few works exhibited (Cravens; Millier, “Nation’s”). Indeed, the direct carver Robert Laurent made public his protest of the NSS’s selection efforts, voicing his opinion that a handful of modernists—like himself—had been invited to participate only in order to ward off complaint. That the modern wing of American sculpture had been silenced by the show, Laurent contended, was made clear by how thoroughly artists of this stripe had been edged out in tactics, for instance, like failing to reproduce their works in the catalogue (“Moderns”). The exhibition pieces had been solicited through an application process, inviting American artists working both at home and overseas, and significant effort had gone into ensuring both a high quantity and wide diversity of submissions. Indeed, while it was a juried exhibition, and while the ten-person selection committee did not represent all wings of current practice (none was an abstract modernist, for instance, the source of the Laurent controversy [“Moderns”]), the exhibition meant to be modern and democratic in its sweep—and attitude. The society neither levied submission fees, nor awarded prizes: a point that appeared frequently in national press on the show. In an advance notice, the Examiner characterized the show’s “liberal … scope” as one of its best features (Douglas, “Fine Exhibit”). Indeed, in all of the show’s pre-opening press, a major point of interest was its range: a feature that was of course central to the NSS goal to represent the breadth of American sculptural practice. Writers marveled at the breadth of styles, but also of scale, noting the contrast between one-inch bronzes and two-ton marbles, between “a carved ivory cat, four inches high” (“Carloads”) and the “wing of a plaster eagle” so massive it could barely “get in the door” (“San Francisco Exhibition”). A dizzying range of emotions also compelled writers: the gravitas of a “large brooding figure” contrasted with a “delightful fountain piece . . . with frogs” (“Carloads”). Finally, visitors taking advantage of the show’s semi-public installation (more on this later) spied sculpture made of all manner of materials. One article itemized plaster, marble, wood, terra cotta, stone, and “bronze statues in all the varying shades of green and brown patinas, and even in gold” (“U.S.A.”). Once fully installed, each of the nineteen indoor galleries housed between fifty and one hundred works apiece (Kistler, “American”). [Figure 9] The NSS enlisted a number of marquee-worthy sculptors (and one landscaper) to help with the installation, including James Earl Fraser, who arrived from New York and was already well known to San Francisco audiences. His End of the Trail had debuted at the Panama-Pacific expo and quickly became its icon. It would appear again in the current show. Four other sculptors worked with Fraser on the installation: M. Earle Cummings, Leo Lentelli, Henry Hering, and Attillo Contini. John McLaren served as the lead on the outdoor galleries. Eighty-three years old, McLaren also enjoyed fame for his work at the 1915 Fair. For that occasion, he had transformed hundreds of acres of sand dunes into Golden Gate Park, thus providing the fair with its grounds. In McLaren’s hands—and with the infusion of “one million dollars’ worth of rhododendrons” (“Flowers”)—the Legion of Honor emerged transformed in 1929: a veritable art-in-nature idyll, with “walls and alleys” built fully out of flowers (“Large”). As had been true with shipping, setting up the exhibit turned out to be a much more laborious task than the NSS anticipated. Although the show was meant to open on April 1, the official opening day didn’t take place until Saturday, April 27, marking the end of two full months of work. The festivities put the capstone on a very long and public process of installation. NSS President Adolph Alexander Weinman officiated and a telegram from President Hoover was read aloud (“$2,000,000”). But if “Saturday . . . belonged to high silk hats [and] Mayors,” as the Chronicle reported, then Sunday “was claimed as their own by ‘just plain folks’” (“50,000”). This news report was especially descriptive: families came from all quarters of the city, bringing both “grandmothers and the kids”; lines stretched in anticipation, reportedly for miles; and the traffic snarled so badly that “owners abandoned [their cars] and walked up the hill.” All told, the two-day unveiling brought in an estimated fifty thousand visitors. Free admission would encourage healthy attendance throughout the show’s run, with 1,067,741 counted at its closing, on New Year’s Day, 1930 (Mitchell). It wasn’t just the free entrance that encouraged attendance. Advertising also played a major role in the show’s quantitative success. To spread the word, the NSS unleashed an aggressive publicity campaign, touting the exhibit everywhere from dinner menus on cruise ships and railroad dining cars to newsreel stories, the latter of which highlighted the herculean efforts behind the show’s installation. By the time the show opened, NSS publicity costs totaled nearly ten percent of all expenditures (excluding shipping): about $6,000 of a nearly $60,000 show (Harwood). At first, the investment proved sound. Paid publicity begat free publicity, most of which was generally optimistic and in support of NSS-expressed ideals, as the above snippets suggest. Audience interest was stoked early on by these reports, many of which included lists of the famous works visitors could expect to see, including not only Fraser’s End of the Trail, but also Daniel Chester French’s seated Lincoln, a smaller version of the monument just recently dedicated in Washington, D.C. In spite of early enthusiasm for the show and apparently widespread support for its contents and goals, the popular press registered a quick about-face after the exhibition finally opened. While internal NSS records don’t cop to this fact, the press on their 1929 blockbuster was uniformly unfavorable, at times almost nasty. Indeed, there’s a whiff in these reviews of something like a critical comeuppance: bursting the bubble of an event so hubristically ballyhooed. However, if we pay special attention to the objections themselves, something more than spite surfaces. What emerges are three main themes, which allow the criticism to become legible as a significant object of historical analysis, especially since each motif parallels interwar-era anxieties about modernized modes of factory production: (1) distaste for the assembly of the show’s monumental pieces (carried out in plain view of anyone who cared to look), (2) attention to the proliferation of multiples or copies in the exhibition (a concern that applied equally to the exhibition itself), and (3) discomfort at the sheer preponderance of objects housed in the show’s galleries (the most palpable display of its excesses). While the last factor is the most conspicuous theme in the critical record—and the one most obviously related to the “overproduction” bogeyman—all three themes connect the discourse of art criticism with the discourse of cultural criticism aimed at the marketplace. As detailed above, the arrival of sculpture in San Francisco attracted considerable reportorial attention, recalling plundered booty, circus trains, and Christmas morn. In keeping with this optimistic spirit, local denizens were encouraged to go investigate. One newspaper recommended taking “your boy” down to the museum grounds (“Carven”): “He will not be permitted to go into the building,” the paper warned, “but it may be his good fortune to witness some of the unpacking.” So it was that the un-crating and reassembly of the exhibition’s hundreds of works of art itself became a spectacle—laying bare the many collaborative, even inartistic and potentially alienated, labors that went into a sculpture’s creation. While most of the works exhibited in the indoor galleries were cast bronze, the larger-than-life monuments slated for outdoor display had been cast in plaster. These arrived at the Legion of Honor in disembodied fragments: “arm by arm, leg by leg, in separate boxes, with the head perhaps in still another crate” (“Sculptures”). Calling the scene “a place of fantasy,” local art writer Louise Landis wrote poetically of “a world suddenly taken to pieces by a pair of deft gigantic hands.” Something of the uncanny was at work here: “fantasy,” yes, but also the sense of a sideshow attraction with so many out-of-sorts body parts. (The circus theme had gone gothic.) Once uncrated, all the various fragments had to be put back together—and carefully, to avoid the potential “disaster” of joining wrong parts to wrong places (“Los Gatos”). Workers conducted this task of reassembly outdoors, aided by photographs and exact measurements, in plain view of the public. Sure enough, the NSS took advantage of this spectacle for yet more publicity, this time a newsreel featuring scenes of sculptors and hired hands uncrating fragments and joining them back together (“Public”). Lentelli and Hering were two accomplished academicians with pieces on display in the show. In his definitive The History of American Sculpture, reissued in 1923, Lorado Taft had praised Lentelli’s “wizardy”; and he had counted Hering’s output to be sizable enough to be of “particular significance” to the development of the national arts. A plaster cast of the latter’s Indiana World War I memorial, Pro Patria, was included in the show and illustrated in its catalogue. But in the newsreel these accomplished artists were seen doing baser work: attaching arms to torsos and wings to angels. Fellow sculptor Contini, a well-known New York caster, was also in the film; he showed up working behind Lentelli and Herring, covering their tracks with a putty knife thick with plaster. What was on view, on the grounds and in the film, were three nationally respected artists going about the customary work of joining and finishing large pieces of sculpture—first-rate pieces, in this case, and authored by the society’s leading lights, including Fraser and Huntington. (Once installed for the temporary NSS exhibit, Huntington’s El Cid made a nice pendant to her Jeanne d’Arc, already permanently installed on the Legion of Honor’s grounds.) But while these painstaking labors were standard sculptural practice (as many of the newspaper stories dutifully reiterated), the copious amount of attention to this reassembly suggests something deeper than just a passing curiosity. In fact, the public display of this “plastic surgery,” as one writer put it (“Date”), seemed to bring to light some potentially problematic similarities between the artistic creation of cast sculpture and the mechanical reproduction of ordinary commodities. For generations, the multiple steps and multiple people required to make a sculpture—demonstrated in San Francisco by the work of Lentelli, Herring, and Contini—had threatened the medium with something like inauthenticity by association. In short, and in the words of sculpture historian Wayne Andersen, sculpture’s “materials and processes of production could more easily [be] aligned along the lines of machine production than could those of painters.” In the view of some interwar-era artists, and as Andersen discusses, this analogy offered sculpture a unique artistic opportunity to issue timely commentary, reflection, and sometimes critique. But alignment—that is, a perceived parallel between sculptural and commercial forms of production—had been a perennial problem for sculpture for generations. It was certainly a problem in 1929, when analogies between sculpture and commercialism allowed critics to diagnose the former with ailments, like overproduction, typically attributed to the latter. This kind of cross-referencing was what allowed a critic like Junius Cravens to deride the NSS’s efforts at installation not only as an “appalling amount of repair work,” but also as symptomatic of “our contemporary decadent sculpture.” At San Francisco, as during many decades before, it appeared that sculpture’s procedural proximity to commercial trades proved to be a defining conundrum for the medium: an issue in need of answering in the age of industrialization. In the years immediately following 1929, this conundrum would arise rather literally for the NSS, brought on by the regulatory procedures of Roosevelt’s National Recovery Administration (NRA). Introduced in 1933, in part as a reaction to the perceived scourge of overproduction, the NRA was designed to allow representatives from industry, labor, and the government to work together to regulate commodity production and distribution, establishing industry-specific norms. When the NRA sought to establish a professional labor code for the production of sculpture, an issue of no small concern to a federal government soon to employ so many sculptors in the New Deal, the NSS found a quibble or two with the terms. In October 1933, NSS secretary Brenda Putnam explained the situation to members. The proposed code would have grouped sculptors “with the Modellers and Plasterers,” for the arbitration of wages and hours: a scenario, she put plainly, “which would not be agreeable to us.” In response, the society drafted a more suitable set of parameters. Their proposed “Code of Fair Competition and Professional Practice” was explicit about what labor-acts defined the sculptor: “The term sculptor as used herein,” it began, “includes any person who is capable of creating an original work of art in plastic form.” This definition was perhaps strategically vague. It could apply capaciously to a wide array of styles and, more importantly, techniques. It emphasized creativity as the defining labor of the sculptor, a form of work that could be construed to be mostly conceptual, and it clearly spelled out the differences between the originating acts of creativity and the practical acts of manufacture. Indeed, taking the whole code together, the NSS put forward a view of sculpture that might also be viewed as managerial, given the number of workers the sculptor might have to oversee: “sculptors’ assistants, apprentices, occasionally carvers, plaster casters, models and secretaries, and sometimes unskilled laborers.” In keeping with the aims of the NRA, the NSS presented a clear schedule of hours and wages for these many types of employment. Sculptor’s assistants, “capable of assisting the sculptor in the execution of his work,” were to be the most highly paid on this scale, at $1.50 per hour. Carvers likewise did quite well at an hourly rate of $1.25. Plaster casters, apprentices, and “unskilled laborers” would be compensated at much lower rates: between seventy-five and forty cents. An artifact of New Deal bureaucracy, the NSS “Code of Fair Competition and Professional Practice for Sculptors” nonetheless is also fully in keeping with a longer rhetorical tradition for sculpture: what Martina Droth has termed the “determined separateness” erected between the medium’s intellectual and practical labors (55). These critics of duplication might also have noticed that the San Francisco exhibition itself was a kind of copy: although almost twice as many works were on view in ’29 than in ’23, the number of artists represented grew more modestly, by just over thirty. In other words, the later show was more or less just an enlarged replica of its predecessor, repeating the contents and installation techniques of the NSS shows before it. Not only that, but the whole spectacle appeared in a building of questionable originality: the Legion of Honor, an imitation of a French prototype that, in turn, was largely a duplicate of the Parthenon. If newness and originality were the characteristics sought by critics and public alike, the exhibition was fated to disappoint. It was deemed a retread, overstuffed with reproductions. But surfeited the critics were: a conceit that revived concerns about decadence and was driven home through a kind of statistical leitmotif of the reportage. “Artistically as well as statistically it will be the greatest public event in the history of American art,” wrote a critic for the Examiner (Douglas, “Fine Exhibit”). The quantitative reporting started early on, with accounts of witnesses counting “carloads of exhibits” at the rail yards, and “hundreds of pedestals and brackets” back at the Palace (“Carloads”). Noting the steep dollar amount of Huntington’s donation, the press also made a point of tallying the $2,000,000 estimated value of all the works on view—part of the ongoing measurement of show’s numerical virtues. Indeed, when the Chronicle finished a long report on all the show’s vital stats, its writer admitted that such metrics might invite an unfortunate “association of art with what seems like mass production” (“San Francisco the Sculptors’ Capital”). While this particular author waved the comparison away, explaining that the size of the show would not be a problem “as long as the taste is good,” the verdict on that front would not be so kind either. Reviewers, again and again, would call “taste,” specifically, into question—and in ways that can re-activate for us now what a morally freighted term that word was. Returning to the Oakland Tribune review, the one so embarrassed by the show’s “riches,” we encounter yet another withering attack. Waxing poetic (but scrambling his metaphors), this writer worried that the NSS had put “too many eggs in one basket,” adding that sculpture, like eggs, can only be appreciated “one or two” at a time (untitled review). The sort of image such language conjures, of an art lover gorging on one too many artworks, would repeat in the critical reception, another pundit wincing at the show’s “omnivorous selection” (“Workers”). These gustatory plays on the show’s bad taste bespoke a certain anxiety about the ill effects of abundance in general, a looming concern for the late 1920s. Indeed, eating metaphors would also suffuse the era’s moralizing discourse on overproduction, as well as the decline its decadence foretold. The marketplace had “choked with its own product,” in one turn of phrase from 1934, penned by Edward Filene, no less (38). In another, from the pen of a British economist in 1932, who worried explicitly about the “evils” of overproduction, the recession amounted to “stomachache,” brought on because “we eat too much and a loss of appetite follows” (Edge 407). If the NSS exhibit invited so many analogies of “art with what seems like mass production” (“San Francisco the Sculptors’ Capital”), this would not be to its benefit. Not in 1929, and certainly not in the decade to come. At long last we come to the one exception in the critics’ chorus of disapproval, the unanimous praise they sung for the show’s hand-carved works. In between the tabletop bronzes and plastered-together monuments, a small minority of works “rather monopolize[d]” the show’s aesthetic appeal (Dixon). Fond references to these works appeared with disproportionate and telling frequency, even though they represented only about seven of the total 286 artists on view, and only about two dozen of the more than 1300 artworks. Exceptional though this praise was, it was otherwise fully in keeping with the marketplace analogies that underwrote the prevailing complaints. Not so much a school as a rhetorical ideal—and an ideal that proved to be upheld more by writers than carvers—direct carving was an eagerly promoted concept by art-writers both overseas and in the U.S. For a transatlantic audience, Ezra Pound praised Henri Gaudier-Brzeska in 1915, noting with approval that he “never cut in one sort of stone a work more fitting another” concluding: he “cut direct” (19). Similar terms enveloped Robert Laurent, the French-born American carver. “He works directly with his medium…without any preliminary studies in clay” (256), wrote Helen Appleton Read in 1926; his chosen “piece of material … suggests the shape” (258). And, in the British context in 1934, Henry Moore would opine: “It is only when the sculptor works direct, when there is an active relationship with his material, that the material can take its part in the shaping of an idea” (qtd. in Kettle’s Yard, 17). Direct carving was thus a movement that prioritized a twinned ethos of craftsmanship and truth-to-materials, advancing a model of sculpture in which creative conception should happen simultaneously with the physical manipulation of materials, not prior to it. In this way the “determined separateness,” which Droth charts in sculpture’s discursive history prior to the early twentieth century, was collapsed—and pointedly. The British direct carver Eric Gill was clear on this need to reinvigorate sculpture through the embrace, rather than the eschewal, of manual techniques. In 1940, looking back at his artistic formation in the 1910s, he wrote: “I was reuniting what should never have been separated: the artist as man of imagination and the artist as workman” (qtd. in Kettle’s Yard, 9). This was an anti-modern form of modernism, then, one that addressed the apparent proximity between sculpture and mechanical, commercial production through rejection and critique. Influenced by early twentieth-century modernism’s wider-spread embrace of pre-modern, non-Western, and non-illusionistic traditions (i.e., of “primitivism”), direct carving was celebrated for its authenticating return to an era of time-honored, even rudimentary, craftsmanship untouched by modern machines. This distinctly anti-modern basis for carving’s embrace—American carver William Zorach called it the “simplest” (“Tools and Materials” 156), “oldest,” and “most natural” (Zorach 191) way of making sculpture—permeated the accolades heaped upon these works in San Francisco. One critic described the show’s carved works as “honest” (“Wood”); the modern carver, he explained (in a quotation I cited above), “cuts as primitives cut without subterfuge or pretense”—without, in other words, the excesses of modern cultural production. The art writer George Douglas, writing in the San Francisco Examiner, advised visitors to the 1929 show to seek out carved works. It was in those, he wrote, that “honesty inheres in the use of chisel and mallet” (“Fine Exhibit”). Readers who followed this advice would have found pleasure in the exhibit’s Gallery 17, dedicated to works carved in wood, including a plant form by Laurent. Reported on in the press as a tinted-wood piece titled Pitcher Plant, the piece was part of a series of works in which Laurent explored the delicate, organic forms of plant life in wood: a desiccated version of the same (Cravens). Directly cut wood pieces by Enrico Glicenstein, Gleb Derujinsky, Estelle Rumbold-Kohn, and Jacques Schnier also appeared in this room. Schnier was local to San Francisco, but had worked in Hawaii for two years and pursued an independent visual education in Polynesian carving traditions (Tarbell 62). In response to his showing in the NSS show, Louise Landis drew special attention to a female figure he had wrought in poplar, noting with special praise how he’d used “the grain of …wood” to his advantage: with it “adding rhythm to the perfect peace of the pose.” Both Laurent and Schnier, then, had furthered modernism’s truth-to-materials tenet, exploiting the materiality of their medium toward expressive ends. While, with the inclusion of Laurent (who was an NSS member) and Zorach (who wasn’t), the 1929 exhibit represented the two sculptors most associated with direct carving in the United States, there were also some gaps. John Flannagan, soon to be another major figure exhibiting carving in New York, was not included; more noteworthy was the absence of both Los Angeles-based Peter Krasnow and San Francisco-based Ralph Stackpole. Stackpole’s absence was particularly acutely felt; his influence in the city through his teaching position at the San Francisco Art Institute had been decisive (Tarbell 59–60). Writing later, in 1930, LA critic Arthur Millier noted this influence, referring to the “group that sprung up in the neighborhood of Ralph Stackpole’s stone-cutting yard,” and characterizing them as “ardent disciple[s] of the healthy cut-direct doctrine” (“A Tour”). Though absent from the NSS show, Stackpole’s modern granite bas reliefs for the San Francisco Stock Exchange would garner national acclaim a year later (Adams). Krasnow’s absence would be remedied, in a sense, too; his unapologetically raw, even Brancusi-like carved wood pieces would be showcased in a solo show in San Francisco in 1930, in the very halls of the Palace of the Legion of Honor (Tarbell 62–64). Direct carving succeeded—at San Francisco in both 1929 and 1930, and internationally throughout the interwar period—on precisely the fronts where the rest of the NSS show had failed. The NSS offended critics with its visible re-assembly of complicated casts, with the lack of originality in its selections, and with the sheer number of works on view. All of these issues—especially to the extent that they were also proxy complaints for marketplace concerns—were imagined to have been redressed by the few exhibited sculptures that had been carved by hand. According to its advocates, directly carved sculpture was not assembled, but revealed; not complicated, but compact; not reproduced, but achieved singly; not cast, but cut; and its origins in hard, reclaimed wood or stone mandated not only a simple aesthetic, but also a modest output of relatively short-statured works. In view of all of this, Millier’s characterization of Stackpole’s carving practice as “healthy” is revealing. Where the British economist had diagnosed “stomachache” as the result of overproduction, in prescription he counseled “not doctors or economists, but … time, good sense, and sensible control” (Edge 407). In San Francisco in 1929, the carvers offered precisely this antidote, including the works of Epstein, whose “austerity,” in the words of one critic, spoke “truth … in stern language” (Davidson). The slight was a damning one. Emmanuel Leutze’s once-beloved canvas was, at the time of this review, cut off its stretcher at the Metropolitan Museum of Art and rolled up for storage, out of sheer embarrassment. In fact, associating the NSS’s sculpture selection with Washington Crossing the Delaware suggested more than just a lag between the plastic arts and painting (although the suggestion that American sculpture had not matured past 1851 was certainly insult enough). With reference to the Leutze, Millier knew that he was also playing upon a tacit cultural distinction between highbrow aesthetic judgment, and popular, middlebrow tastes. Just as art critics of the 1920s and ’30s turned up their noses at the bourgeois “confections” (Millier, “Nation’s”) and “garden inanities” (Grafly 407) favored by the NSS, so too had the post-Civil War art establishment lampooned Leutze’s popularly heroic Washington: a primped and polished “dancing-master … ready to teeter ashore” (“Art Notes”). Could this not have been what was really at issue in San Francisco, then? Could the nation’s many art writers simply have balked on the basis of snobbishness? Lacking proper scientific understanding, the ancients looked to divine explanations. In modern times, economic catastrophes were chalked up to the shadowy hand of overproduction. While Clark thought the shorthand did boast some “true instinct” (booms do tend to precede busts, he conceded), he maintained that its usage was not only unsophisticated but dangerous (2). As an explanation, overproduction ultimately obscured what Clark theorized was the real problem: not exactly too much production, but production that had become “unbalanced or misdirected” (5). It wasn’t just that there were too many goods overall, but too many of the wrong kinds of goods, directed to the wrong sorts of markets. The same could be said for the NSS show in San Francisco. Since 1929, very little has been written about the National Sculpture Society’s enormous show. In his history of the organization, art historian David Dearinger noted the exhibit’s failure, explaining simply: “by that time, public tastes were shifting” (29). Dearinger is right about those shifting tastes. Indeed, current readers might find it hard to sustain disbelief that the exhibition could have been anything other than a flop, given the recherché works on offer. But Dearinger’s remarks are more a description of change than an explanation for it. If we agree that it wasn’t just a matter of too much sculpture, but also a matter of the wrong kind of sculpture, then we still need to account for why it was wrong, and why an anti modern alternative like direct carving was right. To this end, the economically-tinged vocabulary of overproduction supplies an answer. “17 Carloads Required to Bring Works.” San Francisco Bulletin 28 February 1929: National Sculpture Society Records (hereafter NSS), Archives of American Art (hereafter AAA). “$2,000,000 Sculpture is on Exhibition Here.” San Francisco News 29 April 1929. NSS, AAA. “50,000 See Exhibition of Sculpture,” San Francisco Chronicle 29 April 1929. NSS, AAA. Adams, Mildred. “Modern Art Enters a Stock Exchange.” New York Times 8 June 1930: 83. Andersen, Wayne. American Sculpture in Process: 1930-1970. Boston: New York Graphic Society, 1975. “Art Classics Shipped to San Francisco for Novel Exhibition.” San Francisco Examiner 1 March 1929. NSS, AAA. “Art Notes: The Art Gallery of the Sanitary Fair.” New York Times 11 April 1864: 2. “Art Treasure by Ton Due in San Francisco for Show.” San Francisco Chronicle 13 March 1929. NSS, AAA. Barratt, Carrie Rebora, et al. Washington Crossing the Delaware: Restoring an American Masterpiece. Special issue of Metropolitan Museum of Art Bulletin 69 (2011). Breuning, Margaret. “Sculpture Shown in Leafy Setting.” New York Evening Post 12 April 1923. NSS, AAA. “Carloads of Exhibits Arriving for Sculpture Show at Legion Palace.” San Francisco Fillmore News 14 March 1929. NSS, AAA. “Carven Treasures Pour in as if on Roman Galleys.” San Francisco Examiner 8 April 1929. NSS, AAA. Chase, Stuart. “The Enemy of Prosperity.” Harper’s Magazine 161 (November 1930): 641-650. Clark, John B. “Introduction.” Overproduction. By Karl Rodbertus. New York: Charles Scribner’s Sons, 1898. 1-18. Coles, William A. “Masterworks of American Sculpture, 1875-1999.” American Art Review 11.6 (1999): 170-179. Conner, Janis and Joel Rosenkranz. Rediscoveries in American Sculpture: Studio Works, 1893-1939. Austin: U of Texas P, 1989. Cortissoz, Royal. “An Exhibition Revealing All its Characteristics: Our Plastic Art, How it Carries on the Ideals of the Founders.” New York Tribune 22 April 1923. NSS, AAA. Cox, George J. “The Sculptor’s Forms.” American Magazine of Art 27 (January 1934). NSS, AAA. Cravens, Junius. “Our National Sculpture.” The Argonaut 4 May 1924. NSS, AAA. “Date Set for Exhibit Start.” Richmond Banner 12 April 1929. NSS, AAA. Davidson, Mary Hicks. “War Effects Shown in Statues.” San Francisco Call 3 May 1929. NSS, AAA. Dearinger, David. “The National Sculpture Society: A History of Its Early Years.” Sculpture Review 42.3 (1993): 22-29. De Kay, Charles. “The Quarter’s Art: A Rapid Survey.” The Quarterly Illustrator April-June 1894: 193-208. -----. “A Word or Two Regarding the National Sculpture Society.” Third Exhibition of the National Sculpture Society. New York: National Sculpture Society, 1898. 5-12. National Sculpture Society Records, Archives of American Art. Dixon, Constance. “Artists and their Work.” Oakland Tribune 5 May 1929. NSS, AAA. Douglas, George. “Fine Exhibit Will Open April 1.” San Francisco Examiner 10 March, 1929. NSS, AAA. -----. “Fine Works Pouring in at Palace.” San Francisco Examiner 24 March 1929. NSS, AAA. Droth, Martina. “The Ethics of Making: Craft and English Sculptural Aesthetics, c. 1851-1900.” Journal of Design History 17.3 (2004): 221-234. Dunstan, Angela. “Nineteenth-Century Sculpture and the Imprint of Authenticity.” 19: Interdisciplinary Studies in the Long Nineteenth Century (2014): n. pag. Web. Eden, Myrna G. Energy and Individuality in the Art of Anna Huntington, Sculptor and Amy Peach, Composer. Metuchen, NJ: Scarecrow Press, 1987. Edge, Charles N. “The Changing Value of Man.” Living Age 341 (January 1932): 406-412. “Facing the Overproduction Problem.” Literary Digest May 31, 1930: 46. Filene, Edward A. “The New Relations between Business and Government.” The Annals of the American Academy of Political and Social Science 172 (March 1934): 37-44. “Five Societies Unite in Outdoor Sculpture Exhibit.” New York Herald 13 April 1923. NSS, AAA. “Flowers Worth $1,000,000 to Aid Exposition.” New York Tribune 19 February 1929. NSS, AAA. Grafly, Dorothy. “Sculpture at Philadelphia.” American Magazine of Art 26 (September 1933): 407-415. Harwood, Raymond C. “Report, Audit of National Sculpture Society Money.” 13 May 1929, National Sculpture Society Records, Archives of American Art. Hosmer, Harriet. “The Process of Sculpture.” Atlantic Monthly (December 1864): 734-738. Jewell, Edward Alden. “The Skyscraper’s Challenge to Sculpture.” Current History 35 (February 1932): 655-660. Kettle’s Yard Gallery. Carving Mountains: Modern Stone Sculpture in England, 1907-1937. Cambridge, UK: Kettle’s Yard Gallery, 1998. Kistler, Aline. “American Sculpture at San Francisco.” New York Times 12 May 1929: X10. -----. “Great Exhibit of Sculpture Draws Crowds.” San Francisco Examiner 5 May 1929. NSS, AAA. Landis, Louise. “Art and Artists.” San Francisco Bulletin 26 March 1929. NSS, AAA. “Large Sculpture Show Soon to Open.” Art News 16 February 1929. NSS, AAA. Littell, Robert. “The Prices of Comfort.” American Mercury 34 (April 1935): 430-435. “Los Gatos, Carmel Sculptors Enter Work in Exhibit.” San Jose Mercury 28 March 1929. NSS, AAA. Moran, Horace. “National Sculpture Society Report from Horace Moran, Historian April 1, 1930. National Sculpture Society Records, Archives of American Art. Marx, Karl and Frederick Engels. The Communist Manifesto. Ed. Phil Gaspar. Chicago: Haymarket Books, 2005. Michaelsen, Katherine Jánsky and Nehema Guralnik. Alexander Archipenko: A Centennial Tribute. Washington, DC: National Gallery of Art in association with the Tel Aviv Museum, 1987. Millier, Arthur. “Nation’s Sculpture Shown.” Los Angeles Times 12 May 1929: C11. ---. “A Tour of the Galleries.” Los Angeles Times 6 April 1930: B15. Mitchell, Leila Ayer. “The Exposition of Sculpture.” Overland Monthly 88 (February 193): 50. “Modern Sculpture.” San Francisco Chronicle 12 May 1929. NSS, AAA. “Moderns and Academicians Cast Unsculptured Brickbats over U.S. Sculpture Exhibit.” Brooklyn Eagle 12 May 1929. NSS, AAA. Pound, Ezra. A Memoir of Gaudier-Brzeska. New York: New Directions Books, 1970. “Public Curious Over Sculpture Exhibit Here.” San Francisco Chronicle 14 April 1929. NSS, AAA. Putnam, Brenda. “Letter from Brenda Putnam, secretary, to National Sculpture Society Members.” 11 October 1933. National Sculpture Society Records/ Archives of American Art. “The National Sculpture Society.” The New York Times 11 April 1894: 4. “The National Sculpture Society.” The New York Times 27 February 1895: 9. National Sculpture Society. “Code of Fair Competiton and Professional Practice for Sculptors as Proposed by the National Sculpture Society.” National Sculpture Society Records, Archives of American Art. ---. Contemporary American Sculpture. New York: National Sculpture Society, 1929. ---. “National Sculpture Society Exhibition of American Sculpture, 1929, Final Circular of Information.” National Sculpture Society Records, Archives of American Art. “National Sculpture Society Exhibition Opens April 1st.” Art News 2 February 1929. NSS, AAA. Read, Helen Appleton. “Robert Laurent.” The Arts 9 (May 1926): 251-259. Ross, Eleanor F. “A Kingdom by the Sea.” San Francisco Newsletter 25 December 1924: 81. “San Francisco the Sculptors’ Capital for the Next Six Months.” San Francisco Chronicle 20 April 1929. NSS, AAA. “San Francisco Exhibit Draws 17 Cars of Art.” Brooklyn Eagle 23 April 1929. NSS, AAA. “San Francisco Exhibition of Sculpture to be Notable Event.” San Jose Mercury 9 February 1929. NSS, AAA. “Says Our Statues Are Bad.” Editorial article. New York Times 7 June 1894: 4. “A Sculptor’s Triumph.” Art News 21 (April 21, 1923. NSS, AAA. “Sculpture for the Library of Congress.” New York Times 27 June 1894: 4. “The Sculpturefest.” San Francisco Examiner 7 April 1929. NSS, AAA. “Sculptures Shipped.” New York Evening Sun 19 March 1929. NSS, AAA. Taft, Lorado. The History of American Sculpture. 2nd Edition. New York: MacMillan, 1930. Tarbell, Roberta K. “Direct Carving.” Vanguard American Sculpture 1913-1939. Rutgers, NJ: Rutgers University, 1979. 45-66. “Two New York Artists Dominate Exhibit.” New York City World 14 April 1929. NSS, AAA. Untitled review of National Sculpture Society Exhibition. Oakland Tribune 17 March 1929. NSS, AAA. “U.S.A. Sculptury Exhibit Forces Closing Room.” Richmond Banner 8 March 1926. NSS, AAA. Veblen, T.B. “The Overproduction Fallacy.” The Quarterly Journal of Economics 6 (July 1892): 484-492. “Wood Sculpture at Legion Palace Shows ‘Modernism’.” San Francisco Chronicle 19 May 1929. NSS, AAA. “Workers are Busy Preparing for Sculpture Exhibit.” San Francisco Chronicle 17 March 1929. NSS, AAA. Zorach, William. “Tools and Materials: Carved Sculpture,” American Magazine of Art 28 (March 1935): 156-160. ---. Zorach Explains Sculpture: What it Means and How it is Made. New York: American Artists Group, 1947.